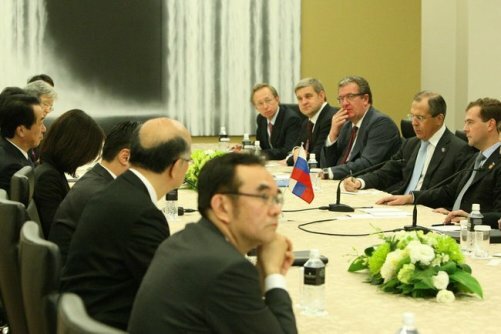 November 13, 2010 (KATAKAMI / KREMLIN.RU) — The leaders of Russia and Japan stated their commitment to developing a dialogue based on trust between the two countries. One of the main subjects under discussion was the Kuril Islands.“ to visit any Russian region, including the Far East, and the Japanese Prime Minister accepted the invitation. PRIME MINISTER OF JAPAN NAOTO KAN (retranslated): Mr President, as you pointed out, the Asia-Pacific region is the centre of global economic development. The region has the highest economic growth rate in the world. I would like to deepen the friendly relations based on partnership and trust between Japan and Russia and will make every effort to achieve this aim. This is our second meeting and I hope that today’s talks will mark the beginning of a full-scale dialogue between us based on mutual trust. November 13, 2010 (KATAKAMI / CNN) — Myanmar’s ruling military junta released democracy activist Aung San Suu Kyi from house arrest Saturday to a throng of supporters trying to reach out and shake her hand. “I’m very happy to see you all again,” she told the crowd gathered near her lakeside home in Yangon. More supporters waited at the headquarters of Suu Kyi’s National League for Democracy. U.S. President Barack Obama said he admired Suu Kyi’s courage. “While the Burmese regime has gone to extraordinary lengths to isolate and silence Aung San Suu Kyi, she has continued her brave fight for democracy, peace, and change in Burma,” he said in a statement Saturday. Security has been stepped up in Myanmar, but it was unclear whether it was related to Suu Kyi’s release or the country’s first elections in two decades that were held last Sunday. “I am personally delighted for her, for her family,” Genser said. He said it was unclear whether anything would fundamentally change in Myanmar, given the recent “sham” elections in the country. Benjamin Zawacki, Amnesty International’s Myanmar specialist, said it made “perfect sense” for the regime to free her since she was no longer an electoral threat to them. Suu Kyi’s opposition party won the 1990 elections by a landslide but the regime never recognized those results. 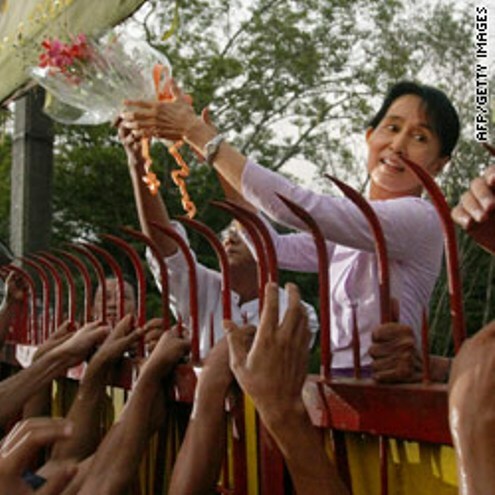 The election Sunday was the first since then but Suu Kyi was barred from participating because of a recent conviction. The Burma Campaign UK, which promotes human rights in Myanmar, accused the ruling junta of rigging the November 7 election. The group welcomed Suu Kyi’s release but warned that it should not be interpreted as a sign that democratic reform is on the way. “The release of Aung San Suu Kyi is about public relations, not democratic reform,” said Zoya Phan, International Coordinator at Burma Campaign UK. “I am thrilled to see our democracy leader free at last, but the release is not part of any political process, instead it is designed to get positive publicity for the dictatorship after the blatant rigging of elections on 7th November,” Phan said. Suu Kyi’s latest house arrest came after she was found guilty of breaching the terms of her house arrest after American John Yettaw swam uninvited to house and briefly stayed there. The regime passed a law that made her ineligible for Sunday’s elections because of that conviction. November 13, 2010 YANGON, Myanmar (KATAKAMI / AP) – Myanmar’s military government freed its archrival, democracy leader Aung San Suu Kyi, on Saturday after her latest term of detention expired. Several thousand jubilant supporters streamed to her residence. “If we work in unity, we will achieve our goal. We have a lot of things to do,” she told the well-wishers, who quickly swelled to as many as 5,000. Speaking briefly in Burmese, she said they would see each other again Sunday at the headquarters of her political party. The 65-year-old Nobel Peace Prize laureate, whose latest period of detention spanned 7 1/2 years, has come to symbolize the struggle for democracy in the Southeast Asian nation ruled by the military since 1962. The release from house arrest of one of the world’s most prominent political prisoners came a week after an election that was swept by the military’s proxy political party and decried by Western nations as a sham designed to perpetuate authoritarian control. Supporters had been waiting most of the day near her residence and the headquarters of her party. Suu Kyi has been jailed or under house arrest for more than 15 of the last 21 years. As her release was under way, riot police stationed in the area left the scene and a barbed-wire barricade near her residence was removed, allowing the waiting supporters to surge forward. Her release was immediately welcomed by world leaders and human rights organizations. “Whether Aung San Suu Kyi is living in the prison of her house, or the prison of her country, does not change the fact that she, and the political opposition she represents, has been systematically silenced, incarcerated, and deprived of any opportunity to engage in political processes,” he said in a statement. British Prime Minister David Cameron also said the release was long overdue. “Aung San Suu Kyi is an inspiration for all of us who believe in freedom of speech, democracy and human rights,” he said in a statement. “It is now crucial that Aung San Suu Kyi has unrestricted freedom of movement and speech and can participate fully in her country’s political process,” European Commissioner Jose Manuel Barroso said. Critics allege the Nov. 7 elections were manipulated to give the pro-military party a sweeping victory. Results have been released piecemeal and already have given the junta-backed Union Solidarity and Development Party a majority in both houses of Parliament. The last elections in 1990 were won overwhelmingly by Suu Kyi’s National League for Democracy party, but the military refused to hand over power and instead clamped down on opponents. Suu Kyi’s release gives the junta some ammunition against critics of the election and the government’s human rights record, which includes the continued detention of some 2,200 political prisoners and brutal military campaigns against ethnic minorities. It is unlikely the ruling generals will allow Suu Kyi, who drew huge crowds of supporters during her few periods of freedom, to actively and publicly pursue her goal of bringing democracy to Myanmar, formerly known as Burma. But some see hope in her release. “There is no formal opposition (in Myanmar) so her release is going to represent an opportunity to re-energize and reorganize this opposition. So in that sense, of revitalizing the opposition in some concrete way, Suu Kyi’s release is going to be very pivotal,” said Muang Zarni, an exiled dissident and Myanmar research fellow at the London School of Economics. Suu Kyi herself earlier cautioned about optimism. “My release should not be looked at as a major breakthrough for democracy. For all people in Burma to enjoy basic freedom, that would be a major breakthrough,” she said after her earlier release in 2002. She rode out the military’s bloody suppression of street demonstrations to help found the NLD. Her defiance gained her fame and honor, most notably the 1991 Nobel Peace Prize. Charismatic, tireless and outspoken, her popularity threatened the country’s new military rulers. In 1989, she was detained on trumped-up national security charges and put under house arrest. She was not released until 1995 and has spent various periods in detention since then. Suu Kyi’s freedom had been a key demand of Western nations and groups critical of the military regime’s poor human rights record. The military government, seeking to burnish its international image, had responded previously by offering to talk with her, only to later shy away from serious negotiations. Suu Kyi — who was barred from running in this month’s elections — plans to help probe allegations of voting fraud, according to Nyan Win, who is a spokesman for her party, which was officially disbanded for refusing to reregister for this year’s polls. Her late husband, British scholar Michael Aris, raised their sons in England. Their eldest son, Alexander Aris, accepted the Nobel Peace Prize on his mother’s behalf in 1991 and reportedly lives in the United States. 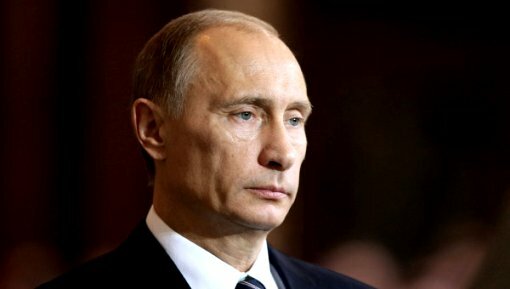 November 13, 2010 (KATAKAMI) — Russian Prime Minister Vladimir Putin will discuss Russian-Bulgarian energy cooperation with his Bulgarian counterpart Boiko Borisov during a working visit to Sofia on November 13. The talks, which will focus on joint energy projects between the two countries, are expected to see the signing of several bilateral documents, including an agreement paving the way for the start of the construction of the South Stream gas pipeline intended to pump Russian gas to Europe under the Black Sea. The agreement, to be signed by the shareholders of South Stream Bulgaria, will allow the creation of a joint stock company to oversee the construction of the Bulgarian section of the South Stream pipeline by the end of the year, the Russian government’s press service said on Friday. This will become the last step towards the start of the pipeline construction, it said. The South Stream project, in which Russia, Bulgaria and Greece are partners, stipulates the construction of a 300-kilometer pipeline from Burgas on the Bulgarian Black Sea coast to Alexandroupolis on the Greek Aegean Sea coast. The pipeline, which is considered a rival to the EU-backed Nabucco, is scheduled for launch in December 2015. Ahead of the visit, Putin and Borisov agreed in a phone conversation to finalize all the issues concerning the Bulgarian segment of the pipeline by the end of 2010. Russian energy giant Gazprom and the Bulgarian Energy Holding EAD will each hold a 50-percent stake in the joint company, which will be registered in Bulgaria. Russia, Greece and Bulgaria signed a contract in 2007 on a joint construction of the Burgas-Alexandroupolis oil pipeline to bypass the busy Black Sea. The pipeline’s capacity will be 35 million tons a year with a possible expansion to 50 million tons. Borisov, the leader of the right-wing Citizens for European Development of Bulgaria party, has made contradictory statements on energy projects with Russia, including a rejection of plans to participate in construction of Burgas-Alexandroupolis. The country has not invested in the project since the summer of 2009, when Borisov became the country’s prime minister. In July, Bulgaria agreed to pay a 6.5 million euro contribution to the operating costs of the project, but its participation is still uncertain. The project has to undergo ecological expertise of the Bulgarian Ministry of Environment and Water, the Russian government’s press service said, adding that the results of the expertise are expected not earlier than next February. In February 2008, an international project company, Trans Balkan Pipeline BV, was set up in the Netherands to carry out the construction of the pipeline. Russia is also involved in the construction of a nuclear power plant in the northern Bulgarian city of Belene. Atomstroyexport, the export arm of Russian state-run nuclear corporation Rosatom, won a tender in for the construction of the plant in 2006. A $4 billion-contract was signed in 2008. In June, Bulgaria suspended the construction of the plant, citing a lack of investment. According to the Russian government’s press service, negotiations have been held with German and Italian companies on the possibility of joining the project. Russia is Bulgaria’s third largest trade partner after Germany and Greece, the press service said. In 2009, trade turnover between the countries accounted for 8.8 percent of Bulgaria’s GDP. In the first half of 2010, Russia was the largest consumer of Bulgarian wine, with imports accounting for 60 percent of all wine sales.